Red River is a 1948 Western film which tells the story of the first cattle drive along the Chisholm Trail in the fictional framework of a cattle man who feuds with his surrogate son over ownership of their cattle in the middle of a drive. It stars John Wayne, Montgomery Clift, Joanne Dru, Walter Brennan, Coleen Gray, Harry Carey, John Ireland, Noah Beery Jr. and Harry Carey, Jr.. The movie was written by Borden Chase and Charles Schnee from Chase's story The Chisholm Trail. It was directed by Howard Hawks and Arthur Rosson. Thomas Dunson (John Wayne) is a stubborn man who wants nothing more than to start up a successful cattle ranch in Texas. Shortly after he begins his journey to Texas with his trail hand, Nadine Groot (Walter Brennan), Dunson learns that his love interest (Coleen Gray), whom he had told to stay behind with the wagon train and that he would send for her later, was killed in an Indian attack. Despite this tragedy, Dunson and his trail hand press on and soon come across a young orphaned boy by the name of Matthew Garth (played as an adult by Montgomery Clift), who Dunson takes in under his wing. Together, with only a couple head of cattle, they enter Texas across the Red River and Dunson proudly proclaims all the land that they see as his own; however, two Mexican men appear on horseback to tell them the land already belongs to their boss. Dunson rejects this information and ends up killing one of the men and telling the other to go back to his boss to let him know that Dunson now owns the land. He calls his new spread the Red River D, the name which he uses to brand the first cattle of his herd, promising to add Matt to the brand once he has earned it. Fourteen years pass and Dunson now has a fully operational cattle ranch. With the help of Matt and Groot, he has managed to raise an impressive herd of well over a thousand cattle, but unfortunately he is broke in the aftermath of being on the losing side of the American Civil War. With the price of cattle in Texas not to his liking, Dunson decides to drive the massive herd hundreds of miles north to Missouri, where he knows he can fetch a much better price. He hires some extra men to help out with the drive and soon enough they all set off on their perilous journey northward. Along the way, the men run into many troubles, including a stampede caused by one of their own men who was trying to steal sugar and attacks from the surrounding Indians. During one of these encounters, the men save a wagon train from the onslaught of the Indians. One of the women they save is Tess Millay (Joanne Dru), who both Dunson and Matt begin to fall for. Deeper problems arise when the tyrannical leadership style of Dunson begins to affect the rest of the men, especially Matt, at which point Matt takes control of Dunson's herd in an attempt to lead the herd and the men to a closer destination in Abilene, Kansas, leaving Dunson behind. Naturally, this infuriates Dunson, who vows to track down Matt and murder him. Matt succeeds in delivering the cattle to Abilene, a town that has been eagerly awaiting the arrival of such a herd; there he receives an excellent offer and willingly accepts it. Unknowingly, Matt has just completed the first cattle drive along what would become the Chisholm Trail. Meanwhile, Dunson acquires a posse and arrives in town shortly after. He attempts to follow through with his promise to kill Matt. The two men engage in a fight to the death, but Tess interrupts the battle, drawing a gun on them and forcing the two to realize the love that they share for one another. Dunson and Matt realize their errors and make peace with each other. When they get back to their ranch in Texas, Dunson follows through with his promise and finally incorporates Matt into the brand. Red River (1948) is a classic and complex western (and considered by many critics to be one of the ten best westerns ever made). It is a sweeping, epic story about a cattle drive (historically based on the opening of the Chisholm Trail in 1867) and a film of rivalry and rebellion, spanning a time period of fifteen years. 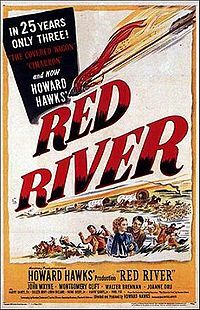 Red River was Howard Hawks' first western, a story often compared to its parallel epic on the high seas, Mutiny on the Bounty (1935). Later westerns he directed included The Big Sky (1952), Rio Bravo (1952), El Dorado (1967), and Rio Lobo (1970). Hawks was well known for his storytelling and his versatility in film genres, spanning screwball comedies (Bringing Up Baby (1938) and His Girl Friday (1940)), romantic comedies (Twentieth Century (1934)), crime/gangster films (Scarface: Shame of the Nation (1932)), mystery-detective noirs (The Big Sleep (1946)), adventure films (Only Angels Have Wings (1939)), and war films (The Dawn Patrol (1930)), to name a few. The film's well-written screenplay (by Borden Chase and Charles Schnee) was based on Chase's novel/Saturday Evening Post serialized story (in six installments from December 1946 through January 1947): The Chisholm Trail. This was one of producer/director Howard Hawks' most extravagant and ambitious films, and cost over $3 million (overbudget) at the time - an exorbitant sum, but became a top-grossing film of the year. Gary Cooper was originally chosen to portray Tom Dunson - ultimately played by John Wayne, but refused on the role because of the character's ruthlessness and contemptibility. And Cary Grant also turned down the role of gunslinger Cherry Valance, ultimately played in a reduced part by John Ireland. The film, shot on location in Arizona (near Elgin) and Mexico, authentically chronicles an epic, bleak and tough journey, similar to the ones in The Odyssey or in Exodus (in the Old Testament), that is fraught with external dangers, threats, tests of strength, and internal contentious tensions between its two strong-willed, conflicting leaders: a hard-nosed, bitter, ruthless and tough commanding father (John Wayne in one of his best performances and his first film, of five, for Hawks) and his men, defiantly led by his less harsh, surrogate, adopted son (Montgomery Clift, in his first film, after being noticed acting in the Broadway stage production of Lillian Hellman's The Searching Wind).